It has been requested that the title of this article be changed to List of governors of Washington. Please see the relevant discussion on the discussion page. The page should not be moved unless the discussion is closed; summarizing the consensus achieved in support of the move. The Governor of Washington is the head of the executive branch of the Government of the State of Washington and commander-in-chief of the state's military forces. The officeholder has a duty to enforce state laws, the power to either approve or veto bills passed by the Washington Legislature and line-item veto power to cancel specific provisions in spending bills. The Washington Governor may also convene the legislature on "extraordinary occasions". Washington Territory had 14 territorial governors from its organization in 1853 until the formation of the state of Washington in 1889. Territorial governors were appointed by the President of the United States. Elisha Peyre Ferry had the longest term of eight years and went on to become the state's first governor. William H. Wallace was appointed governor but never took office due to being elected as the territory's congressional delegate. George E. Cole was appointed governor and took office, but his appointment was never ratified by the U.S. Senate and he was replaced as governor after four months. For the period before Washington Territory was formed, see the List of Governors of Oregon Territory. Washington Territory was created on March 2, 1853 from the northern half of Oregon Territory. At this point, Washington Territory also included the northern panhandle of modern Idaho and parts of Montana. The southern half of Idaho was assigned to the Washington Territory in 1859 after Oregon was admitted as a state. Idaho Territory was split from Washington Territory in 1863 giving Washington Territory its final borders. Due to the long distance between Washington, D.C. and Olympia, there was often a lengthy gap between a governor being appointed and his arrival in the territory. Washington was admitted to the Union on November 11, 1889. The term for governor is four years, commencing on the second Monday in the January following the election. If the office of governor is vacant or the governor is unable to discharge their duties, the lieutenant governor assumes the office of governor. If both the offices of governor and lieutenant governor are unable to fulfill their duties, the secretary of state is next in line, and then the treasurer. There is no limit to the number of terms a governor may serve. The office of lieutenant governor is not elected on the same ticket as the governor. Six of Washington's territorial governors and four of its state governors have served higher federal or confederate offices, or as governors of other states. Three represented Washington Territory as delegates to the U.S. House, and one additionally represented Idaho Territory in the same fashion, as well as serving as Governor of Idaho Territory. Two territorial governors represented eastern states, one as a representative from, and governor of, New Jersey, and one represented Virginia both in the United States and Confederate Houses. Three governors represented the state in the U.S. Senate, and two represented the state in the House. One governor has served in the United States Cabinet. Two of the territorial governors (marked with *) resigned their office to serve as territorial delegates. ^ Note that this statistic includes only states; the District of Columbia has been controlled by elected Democrats since 1975. ^ Due to the long distance between Washington D.C. and Washington Territory, and the slow speed of communications and travel of the day, weeks or months could go by between the appointment of a governor and the governor actually taking office. The actual dates governors took office are sometimes vague; the ones in this list are cited mostly with contemporary news coverage, but other resources and almanacs give slightly different dates. ^ Received a leave of absence in May 1860 to move his wife from Texas to Kentucky. He never returned to Washington Territory. ^ Appointed as governor, but did not take office as he was elected as a delegate from Washington Territory. ^ a b President Johnson removed Governor Pickering in November 1866. Governor Cole arrived on January 8, 1867 after being appointed governor. Governor Pickering would not relinquish power until the U.S. Senate approved of Governor Cole's nomination on the basis that President Johnson was being impeached. However, the state's legislature looked to Governor Cole as the real governor. The U.S. Senate eventually failed to ratify his nomination. ^ a b c Was a resident of Washington Territory at the time of appointment. This could have cut down on the time between appointment and taking office. ^ The official numbering includes ten Democrats, 12 Republicans, and John Rogers, who served as both a Democrat and a Populist. Rogers' term is counted as both Populist and Democratic. ^ Rogers was elected as a Populist for his first term and a Democrat for his second. ^ a b As lieutenant governor, filled unexpired term. ^ Lister became ill during his second term, relinquished his office to the Lieutenant Governor, and died a few months later. ^ As lieutenant governor, Hart filled the unexpired term after Lister relinquished his office due to ill health. ^ a b c d Represented the Democratic Party. 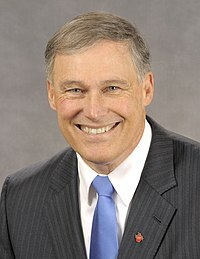 ^ Inslee's second term expires in January 2021. McMullin, Thomas A.; Walker, David (1984). Biographical Directory of American Territorial Governors. Westport, Connecticut: Meckler Publishing. ISBN 978-0-930466-11-4. Ficken, Robert E. (Winter 2005–2006). "Figureheads of State". Columbia Magazine. 19 (4). Retrieved January 27, 2011. Meany, Edmond S (1915). Governors of Washington : territorial and state. Seattle: University of Washington. Retrieved June 30, 2010. "Washington Territorial and State Governors". Washington Secretary of State. Retrieved July 1, 2010. "Governors of Washington". National Governors Association. Archived from the original on February 16, 2011. Retrieved February 22, 2011. "Washington State Constitution". Washington State Legislature. Retrieved July 3, 2010. ^ "2013 and 2014 Salary Schedule, Adopted May 22, 2013" (PDF). Washington Citizens' Commission on Salaries for Elected Officials. Archived from the original (PDF) on September 10, 2013. Retrieved February 12, 2014. ^ a b WA Const. art. III, § 2. ^ WA Const. art. III, § 8. ^ a b WA Const. art. III, § 5. ^ WA Const. art. III, § 12. ^ "What 2014 elections say about 2016 governor's race". SeattlePI. September 29, 2014. Retrieved October 5, 2014. ^ Brunner, Jim (August 11, 2012). "McKenna win would end drought for GOP in races for governor". The Seattle Times. Retrieved March 28, 2018. ^ "Founding of Washington Territory and Washington State". HistoryLink.org. Retrieved June 29, 2010. ^ "Washington Territory". Chronological History of Idaho. State of Idaho. Archived from the original on June 17, 2010. ^ Brosnan, Cornelius James (1918). History of the State of Idaho. Charles Scribner's Sons. pp. 117–128. Retrieved June 29, 2010. ^ "Glorious News for Washington! Arrival of Governor Stevens" (PDF). Washington Pioneer. Olympia. December 3, 1853. Retrieved July 2, 2010. ^ "Letter from Gov. Stevens" (PDF). Pioneer and Democrat. Olympia. August 14, 1857. Retrieved July 2, 2010. ^ "Arrival of Governor McMullen" (PDF). Pioneer and Democrat. Olympia. September 11, 1857. Retrieved July 2, 2010. ^ Bancroft, Hubert Howe (1890). History of Washington, Idaho, and Montana: 1845–1889, Volume 31. Washington State Library. p. 209. Retrieved January 27, 2011. ^ "Sworn In" (PDF). Pioneer and Democrat. Olympia. Retrieved July 2, 2010. ^ "Granted Leave of Absence" (PDF). Pioneer and Democrat. Olympia. May 18, 1860. Retrieved July 2, 2010. ^ "Wallace, William". Biographical Directory of the United States Congress. Clerk of the United States House of Representatives and Historian of the United States Senate. Retrieved January 27, 2011. ^ "Our New Governor" (PDF). Puget Sound Herald. June 12, 1862. Retrieved July 2, 2010. ^ a b c "Gubernatorial War!" (PDF). Puget Sound Weekly. January 14, 1867. Retrieved July 2, 2010. ^ "Arrival of General Moore" (PDF). The Vancouver Register. August 31, 1867. Retrieved January 21, 2010. ^ "Flanders, Alvan". Biographical Directory of the United States Congress. Clerk of the United States House of Representatives and Historian of the United States Senate. Retrieved January 27, 2011. ^ a b "Governor Ferry's Retirement" (PDF). Puget Sound Mail. October 31, 1880. Retrieved July 2, 2010. ^ McMullin and Walker pp. 322–328. ^ Snowden, Clinton (1911). History of Washington: the rise and progress of an American state. New York: Century History Company. p. 153. Retrieved July 3, 2010. ^ "Constitutional and Statutory Provisions for Number of Consecutive Terms of Elected State Officials" (PDF). National Governor's Association. Archived from the original (PDF) on June 29, 2011. Retrieved July 3, 2010. ^ "John Rankin Rogers". Washington State University Libraries. Retrieved January 21, 2010. ^ a b "Change of Governor in Washington". The Christian Science Monitor. February 14, 1919. Retrieved January 21, 2011. ^ "Stevens, Isaac Ingalls". Biographical Directory of the United States Congress. Clerk of the United States House of Representatives and Historian of the United States Senate. Retrieved June 29, 2010. ^ "McMullen, Fayette". Biographical Directory of the United States Congress. Clerk of the United States House of Representatives and Historian of the United States Senate. Retrieved June 29, 2010. ^ "Wallace, William Henson". Biographical Directory of the United States Congress. Clerk of the United States House of Representatives and Historian of the United States Senate. Retrieved June 29, 2010. ^ "Flanders, Alvan". Biographical Directory of the United States Congress. Clerk of the United States House of Representatives and Historian of the United States Senate. Retrieved June 29, 2010. ^ "Newell, William Augustus". Biographical Directory of the United States Congress. Clerk of the United States House of Representatives and Historian of the United States Senate. Retrieved June 29, 2010. ^ "Squire, Watson Carvosso". Biographical Directory of the United States Congress. Clerk of the United States House of Representatives and Historian of the United States Senate. Retrieved June 29, 2010. ^ "Wallgren, Monrad Charles". Biographical Directory of the United States Congress. Clerk of the United States House of Representatives and Historian of the United States Senate. Retrieved June 29, 2010. ^ "Evans, Daniel Jackson". Biographical Directory of the United States Congress. Clerk of the United States House of Representatives and Historian of the United States Senate. Retrieved June 29, 2010. ^ "Lowry, Maichael Edward". Biographical Directory of the United States Congress. Clerk of the United States House of Representatives and Historian of the United States Senate. Retrieved June 29, 2010. ^ "U.S. Senate Confirms Gary Locke as Commerce Secretary". United States Department of Commerce. March 24, 2009. Archived from the original on January 29, 2010. Retrieved July 3, 2010. Wikimedia Commons has media related to Governors of Washington Territory and Governors of Washington.